I have to admit I was reticent about the vision of Archie and his gang that Riverdale offered. The pilot episode established a Twin Peaks meets the CW murder mystery and put the characters in as many "look we're edgy" scenes as possible ("Look! Archie's banging a teacher!" "Look! Betty and Veronica making out!" "Look! Moose is in the closet!"). The teenagers seemed more Dawson's Creek than Archie, and the adults were unrecognizable. Over time, though, I came around to the show. 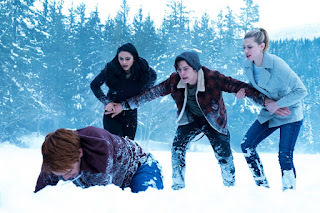 It helped that Roberto Aguirre-Sacasa, the Chief Creative Officer at Archie Comics is the Executive Producer for the series, and he's successfully overseen updates to the character before, both with the future stories of a married Archie and the full reboot the franchise has received. From Chick to modern teen chic. It's not like Archie hasn't changed with the times. When he was first introduced, he went by the name Chick because he hated the name Archie and didn't have a lot of character development other than he'd do anything to impress Betty Cooper. Over time, Archie evolved into the teenage everyman, with his surrounding cast growing to match him. We've seen Archie's cast become more diverse, in terms of race, physical ability, and sexual orientation. The cast has taken on serious issues from time to time, from typical teenage angst and pressures to more dramatic tragedies, such as homelessness and life-changing health issues. Dating Jughead is nothing compared to satanic stigmata. This has been especially true of the newly rebooted Archie titles that have been making waves with serialized stories told by top talent. The modern Archie Comics has shown that it's willing to make substantial changes (whether those changes will last or not is still to be determined) and experiment with storytelling. Writers are able to put a major character into a wheelchair or have the gang go up against a clandestine military program run amok. And the publisher is producing multiple alternate takes on the characters, pitting them against zombies or having them join a coven. 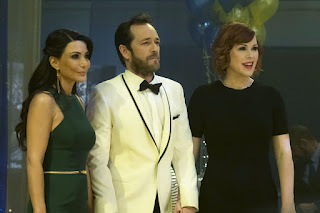 Given that level of freedom, a 90210 version of Riverdale isn't that far out. This shows that the Archie characters can thrive in almost any setting because it's the characters themselves that are key to the franchise's success, not the trappings and circumstances. As long as Archie is the most stand-up guy of the group, Jughead is just a little bit odd, and Betty and Veronica are friendly rivals (or antagonistic friends), the characters can shine through almost anything. Selfish kids don't risk their lives to save someone they don't even like. Ultimately, Riverdale's portrayal of the Archie gang largely worked. Despite the "edgy" storylines, deep down, these are decent kids. Kids that are flawed, can be selfish, and make mistakes, certainly, but also kids that care for one another and wish no serious harm to anyone. The most villainous of the teens, Cheryl Blossom, was catty and more than a little imbalanced, but not actually evil. Really the only one of the kids whose character went horribly awry was Dilton Doiley, who is portrayed as a serious paranoid doomsday prepper. While he was nearly unrecognizable, the rest of the cast started to feel familiar as the first season progressed. you're having an affair with to the prom. In a twist on the genre, the real conflict in Riverdale is driven by the adults, who could learn a few things from their kids about being good people. Given the parents are all from the town originally, you have to wonder what they were like in high school. Were they the same good kids their sons and daughters are? And if so, what caused them to become the selfish, often awful people they are as adults? Is this the future for Archie and his friends, or will they escape becoming their parents? Perhaps the series will address this given enough time. If they continue to tell interesting stories featuring a recognizable Archie cast, I'll be there to find out. The second season of Riverdale premieres Wednesday, October 11.